What I love about greens is the chlorophyll they convert straight from the sun that boosts nutrition for optimum health and well being. There are many other health benefits of consuming green smoothies daily. Nutrient Dense Nutrition at its best. Chock full of vitamins, minerals and enzymes. The consistency of your green smoothie is really up to you. Some people prefer thick soupy smoothies while others like it thin and watery. If you go the thin route be sure and make plenty so that you still get a good amount of fruits and vegetables in. What type of greens should be used? Any type of green leafy vegetable that is soft enough to wrap around your finger. Things like cabbage or broccoli are too starchy and do not mix well with fruit. Spinach is a great one to start with as it has a mild flavor and blend easily. Asian greens like bok choy or wild greens like dandelions, cleaver or sorrel. Try mixing different choices and find which ones tempt your taste buds the most. Bananas make an excellent base for creamy smoothies and blend well with most other types of fruit. For the most part, try and use local in season fruits and berries. Choose from berries of all kinds, citrus fruits, apples, pears, peaches, tropical fruits like pineapples and mangoes. You could even throw in a few goji berries or a few raisins for extra sweetness. Just because it’s named a green smoothie doesn’t mean that the color will always be green. As you introduce more berries into the smoothie the color changes and may not be your favorite color but the nutrition is there. Frozen bananas are a nice touch as well as frozen mangoes. They add a nice sweet flavor and great texture and help to mask some of the stronger green flavors. You can slice your peeled, ripe bananas into pieces and put them in freezer bags or Tupperware containers before freezing. A glass or two of green smoothies a day is perfect for adding important nutrients to your daily diet. You can drink it as a meal or split it into a couple of smaller smoothies to drink throughout the day. Remember moderation is the key here, you still need to eat other ‘rea’ foods as well. To save time, you can prepare your green smoothie a few days in advance and store in your fridge. All you do is dump everything into the blender blend and go. You can get greens in a bag prewashed and ready so there’s no excuse…especially “I just don’t have time to eat healthfully”. For many people the green smoothie is their answer for getting the required amounts of daily recommended fruits and vegetables into their diets…especially vegetables. Green smoothies can be prepared in minutes and could be called the ultimate modern fast food because it is an easy and fast way to get a range of veggies in one hit. Many people have cured themselves of all sorts of health problems by incorporating green smoothies into their diets. The body is an amazing machine and given the right fuel it can definitely heal itself. Add a liquid: Liquid is necessary for helping your blender to mix the ingredients. You can use coconut water, filtered water or fruit juices (not the commercial kinds) and milk. Most people choose to steer away from animal milk as a liquid and use plant-based milks made from hemp, almond, oat or rice. Pick Your Base: You need something to give your smoothie a creamy texture. Banana, mango, peach, pear, apples, papas and durians all work well. 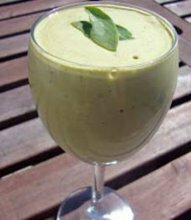 You can also opt for 1/2 avocado or coconut meat to thicken your smoothie. Mixing Flavors: Adding berries, citrus fruits, pineapple or other strongly flavored fruit is optional but they do enhance the flavor of your green smoothies as well as boost the overall nutrition. You can also flavor your smoothies with vanilla bean, clover, cinnamon or even cayenne pepper. Add Your Greens: You can make smoothies with just fruit but greens are an essential part of a healthy smoothies regimen. Greens should always make up a significant portion of your diet. Baby fresh spinach is a great way to start making your green smoothies. And I guarantee you that by the time you toss in the fruits and berries you’ll never know it’s there…but your body will feel the effects of the nutrition. Blend It Up: If you are not using a high-end blender like Blendtec or Vita-Mix blender you may need to chop your greens rather than adding them whole. Do not over-blend your smoothie. Make it smooth enough to drink through a straw but don’t blend for more than a minute at most to reduce oxidation and nutrient loss. Protein Powders: Your green smoothies are nutritious enough but if you really want to go all out for a super healthy kick, use your smoothie to deliver extra protein, vitamins and super foods to your diet. Any type of protein powders should work in a smoothie although some types or brands might be more chalky than others. Now that you’ve gotten a primer on the art of making the perfect smoothie it’s time to try them out for yourself. Use what veggies and fruit is in season in your area and change it around depending on what is available. You can even start by simply adding a very small amount of greens to your smoothie until you get used to the idea then slowly increase over time. Are you on a mission to lose weight but it seems as though all your efforts to slim down no longer work? Take my 60 second test to find out how you fare on the “Weight Loss Resistance Scale”.